Apparently, (according to this farmer that my cousin talked to at a farmers market downstate) after the peepers start singing, if you count three hard frosts, it’ll be okay to plant. When you’re downstate in Michigan, it is typically safe to plant on Memorial Day weekend. Up north, in the Grand Traverse area, you may want to wait until the first of June. Or if you listen to the old farmers who would know, you can plant anytime after the 3rd frog frost regardless. The nighttime low temperatures are rising and I cannot wait any longer. This morning I decided to go see the best growers I know. 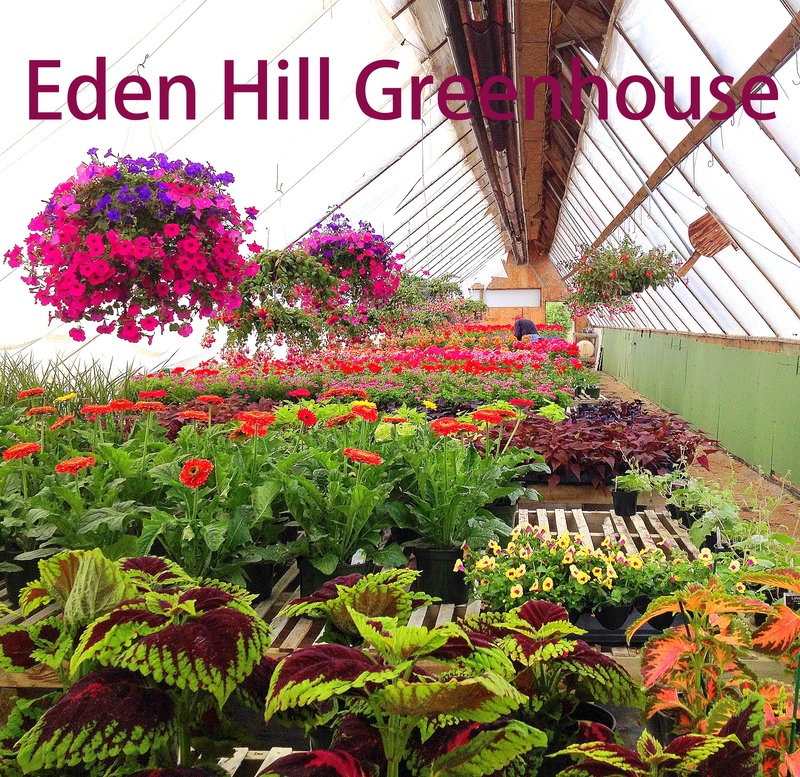 Eden Hill Greenhouse is small outfit on the west end of the Grand Traverse area in Benzie County, Michigan. Pete and Tim Volas own the business and oversee all of the growing. Pete had been a vegetable farmer in Missouri before he moved to Michigan about 30 years ago, and while began with veggies here as well, he soon converted his business to growing wholesale flowers. You may know Tim from the Traverse City Farmers Market. They always have the most beautiful chrysanthemums in the fall. After Tim graduated from college, he came back to the area to join the family business. About ten years ago, Pete’s wife Barbara (Tim’s Mom) became ill. It was a very challenging time for the family all the way around. Running a business only added to the difficulties they were experiencing. 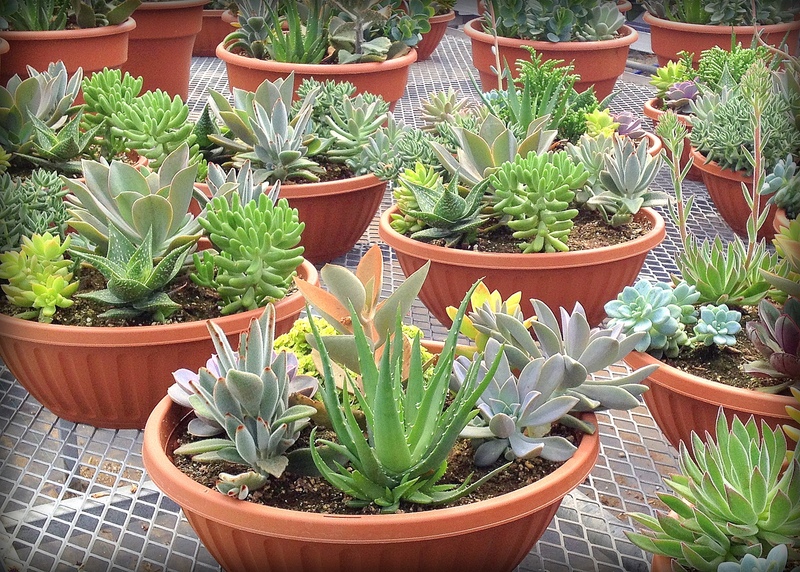 In order to lighten the demand from the greenhouses, they converted the business once again, moving away from wholesale they began selling directly to the public. Opening to the public has proven to be a good decision for the Volas family. It has certainly been a great thing for those of us who get to shop here too. Stepping into this greenhouse is an experience so incredible they could easily be charging admission. But don’t tell them that! Meet Otto. The first thing I saw today when getting out of my car was this face. The picture is a little blurry, and it’s even upside down because I wasn’t ready for him. And by the time I was, he was off to greet the next person. 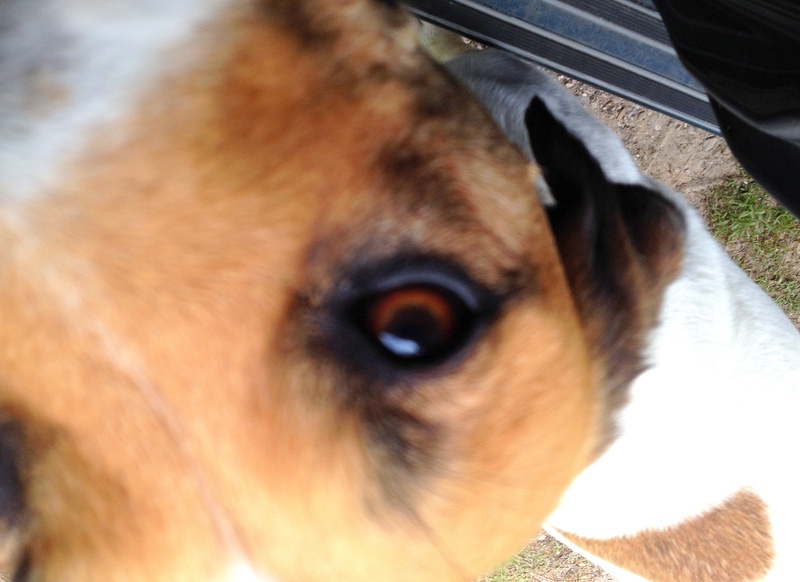 But in my brief encounter with Otto, he brought a smile to my face. The next thing I saw, brought another one. It was this perfect lilac. Of course it’s not part of the inventory, just a bonus for me there at the edge of the parking lot enhancing the view. So I had to share it with you. The view from inside the greenhouse offers an even more spectacular view. The display is an explosion of color. 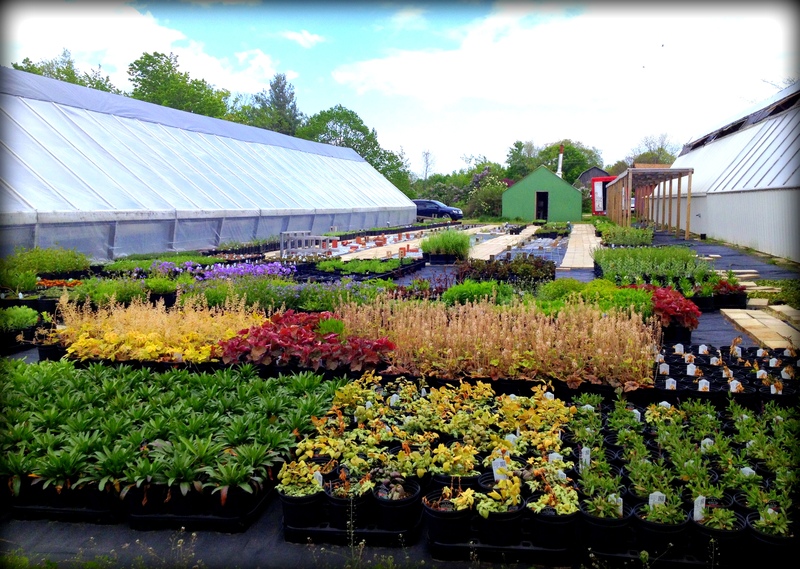 You’ll find the selection is superior quality with plants ranging from fresh herbs to cactus. And you’ll find the most amazing hanging baskets ever. I took the above picture just inside the central greenhouse where Pet and Tim have assembled a nice variety of annuals for our easy shopping. You can see gerbera daisies, geraniums, petunias, fuchsia and the most beautiful coleus. You can call this one stop shopping and be perfectly satisfied or you can venture into the other greenhouses.That would be my recommendation. There are five greenhouses all together and I found these succulents in one of the greenhouses out on the other side of the drive. There are a lot of unusual plants in this one, many of which are not picture. You’ll have to go there to see them and when you get there, you won’t find planters like this just anywhere. These are really special. Outside, centered between two of the greenhouses is where you’ll find the perennials all lined up. 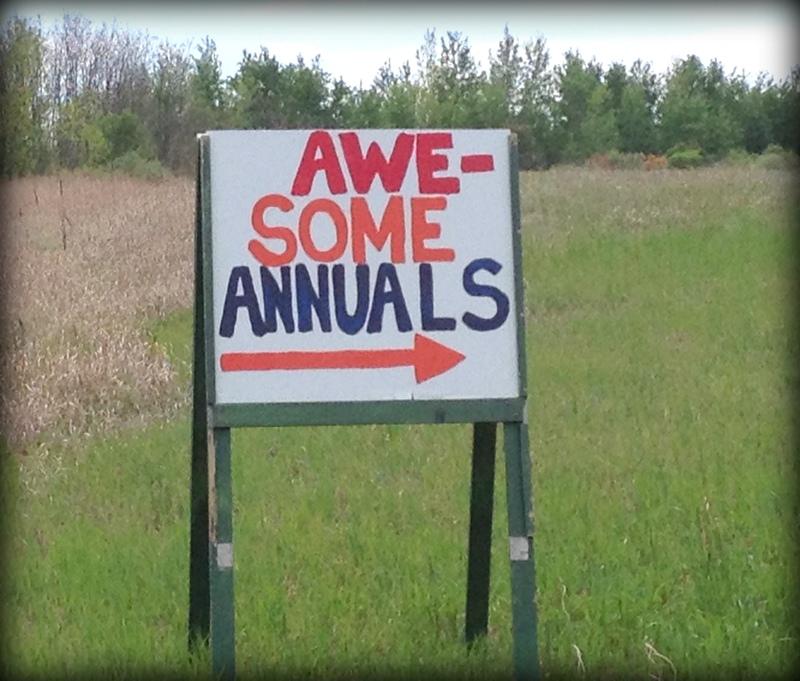 Whether you are looking for annuals, perennials, flowers for you or for a friend, or just the experience, you’ll find something that delights you. Here’s how to get there. It’s at the top of the hill on U.S. Route 31 just before you go around the bend and down the hill heading into downtown Beulah (coming from Grand Traverse County). You’ll turn west on Lincoln Road by the Presbyterian Church-the one with the big windows that overlook the Lake Michigan shoreline. The map below is a link to help you out along with some visuals that may help guide you. Look for these signs and the church on the hill at the corner of Lincoln Road and U.S. Route 31. 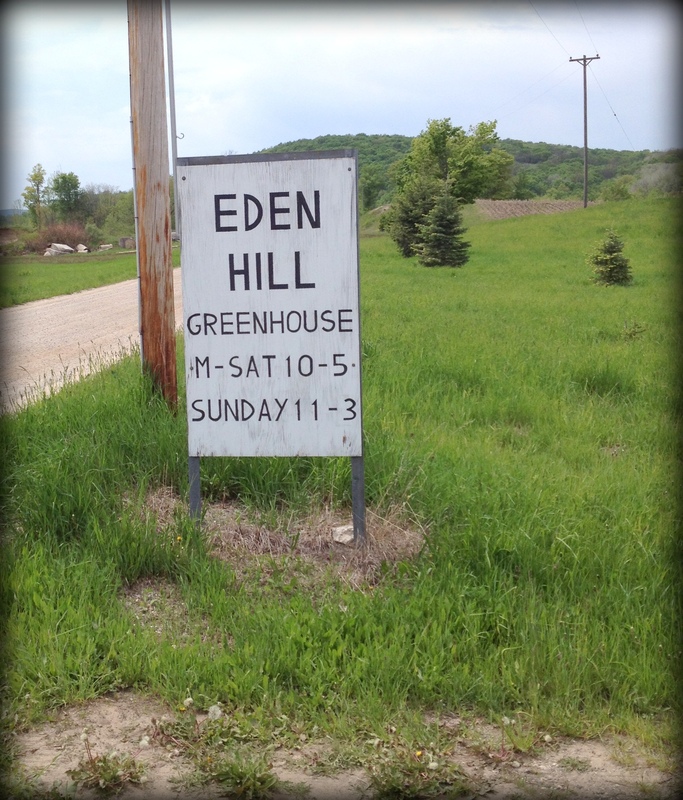 You’re going to actually cross Eden Hill Road and enter off of Lincoln to the back of the greenhouses. Parking is a little tight, but if you pull down the dirt road that winds through the greenhouses you’ll find a spot. Historically, a red door on the front of a building has meant many different things. From welcoming visitors to signifying status. A red door has even signified a safe house in the underground railroad in the time of the U.S. Civil War. In my research, I found a site with a nice summary of the variety of meanings from over the years. 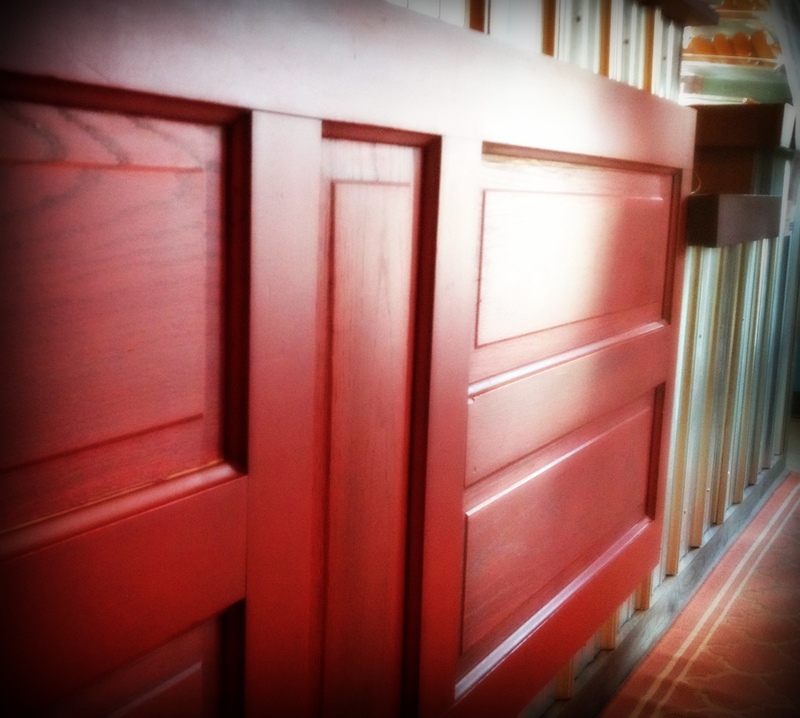 According to American Red Door, in early American tradition, a red door became a symbol to weary horse and buggy travelers that a home was a safe place to rest. Have you seen the new red door in downtown LA? In downtown Lake Ann. In Michigan, that is. And what this particular red door represents is a good cup of coffee and a cool place to hang out. (You’ll have to leave your horse and buggy outside though.) Right next to the Almira Township Hall, and across from the Lake Ann Post Office, you’ll find it. You’ll begin to relax as soon as you pass through that red door. The welcoming eclectic decor is highlighted by the corrugated steel ceiling original to the building (when it was the village fire house). The walls are covered with work by local artists that are available to purchase. There are cozy sitting areas as well as dining tables. It would be a great place to bring your laptop and get some work done. 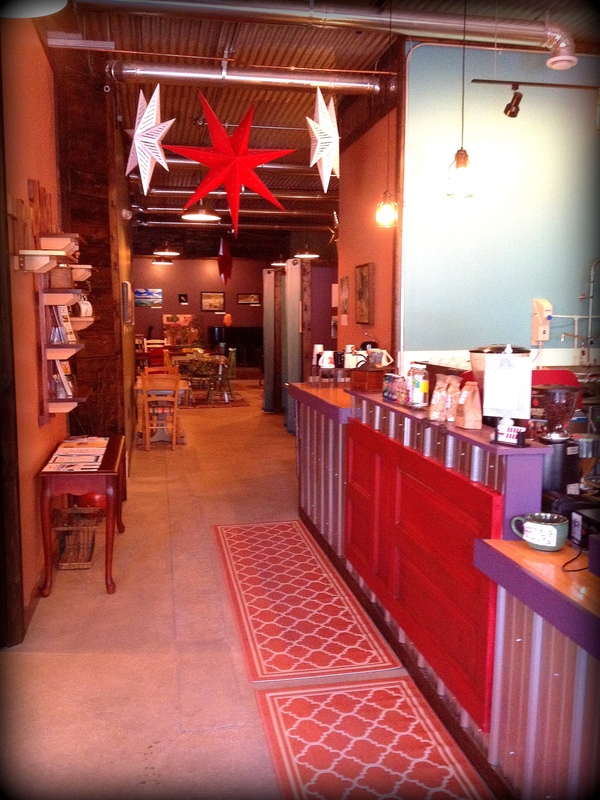 All in all, The Red Door Coffee House is a good representation of the best of northern Michigan. 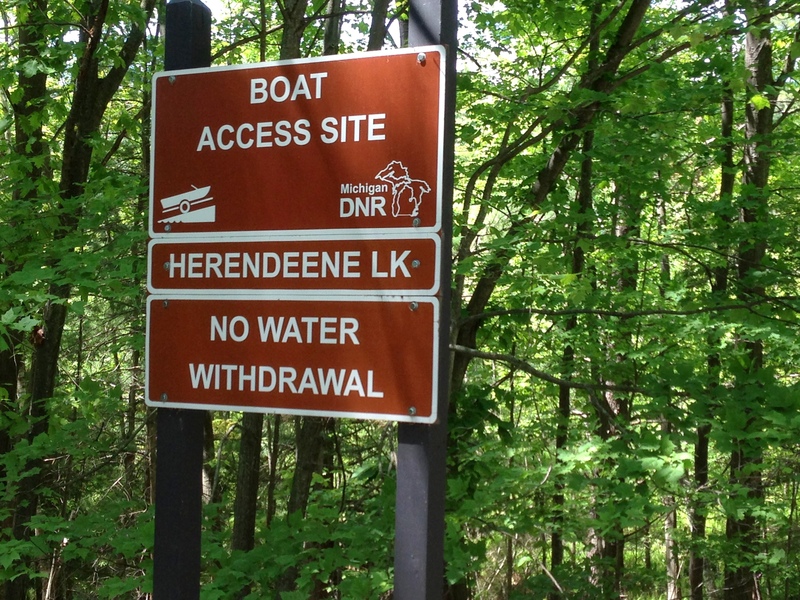 Herendeene Lake is located off Reynolds Road in Almira Township, Benzie Coutny, just about five minutes north of Lake Ann, Michigan and about 25 mintues from Traverse City. When I woke up this morning I could almost hear the blooming trees outside. So I hopped in the car to take a ride through the heart of Leelanau County to see how the apple blossoms were coming along. As you head towards the lake (Lake Michigan) from Traverse City on M-72, you’ll find a cute little local market on the corner at Maple City Road. I’ve been meaning to check it out, so I decided today was the day. Since this is a main through-way from Traverse City out to Lake Michigan, Empire, Glen Arbor and Leland, it would be a great place to stop and fill the cooler with a picnic lunch. These sandwiches were already made up in the cooler and were very reasonable priced at 2.99 a piece. You could easily feed a crowd without breaking the bank. Gabe’s is a cozy little market that has that “up north” feel and by that I mean it’s nothing fancy and far from a big chain style. And it smelled delicious. They offered a variety of local meats and cheeses as well as some hot and ready to eat hotdogs and sausage that were made on site. This carving on the log was the first thing I saw when I walked up to the shop and at the time I thought it was pretty cool. Years ago, in the 1990’s, our good friends knew they had an open invitation to come hang out at our house every Monday night. The only catch was you had to be there by 10:00. That was the time our favorite show, Northern Exposure came on the television. It was an open door on Monday nights. Just for our closest friends. We have never done that with any other television show. Never had before then, and haven’t since. We were hooked. I think it was a combination of the story being told along with the blend of unique characters that lived in Cicely, Alaska. The tight-knit community they evoked on the show inspired us to create our own little community in Traverse City on Monday nights all winter long. Today, we spent the day at the Lake Ann Snow Pine Fest . Lake Ann is a little village about twenty minutes south-west of Traverse City. The locals call it LA. We felt like we’d been placed into the set of Northern Exposure. The locals call it LA. We felt like we’d been placed into the set of Northern Exposure. The small town feeling was prevalent and charming. The first guy we met stopped to talk with us while we got out of the car. He gave us the rundown of the day. We had just missed the pancake breakfast, but could still catch lunch at the town hall. I think he was the towns Maurice Minnifield. Kids were having fun at a good old-fashioned pickup game of broomball on the village ice rink just off the park. A red tractor ride pulled both young and old up the street to the museum and to a sledding hill complete with a warming station and hot cocoa to keep you warm! We headed over to the town hall and took Maurice up on a bowl of chili, which we did but only after checking out the locally made quilt display at the Methodist church. This was an impressive display of handmade quilts made by the women of LA. The Almira Township Hall is a historical building in the center of town with original (creaky) wood floors, worn down by many community gatherings over the years. We enjoyed our lunch and stayed for the live entertainment. The band played a mix of bluegrass and rockabilly. They were good! I really liked his white guitar. Mother Nature provided a very wintry atmosphere for the Snow Pine Fest this year. These mailboxes buried in the snow bank prove it. It can be a challenge for the mailman, so they say. And I believe it. If it wasn’t bright orange, I may not have even seen this box buried in the snow. The Grand Traverse area basically covers the tip of the pinky finger on your hand map. What? You don’t know what a hand map is? Then you must not be from Michigan! If you were from Michigan, you’d hold your left hand up, and with your right hand you’d point to the space where your pinky meets the ring finger. That’s the Grand Traverse area. There are several counties that make up the region, all centering around Traverse City. The main hub of activity happens in T.C. It’s where you’ll most likely fly into. 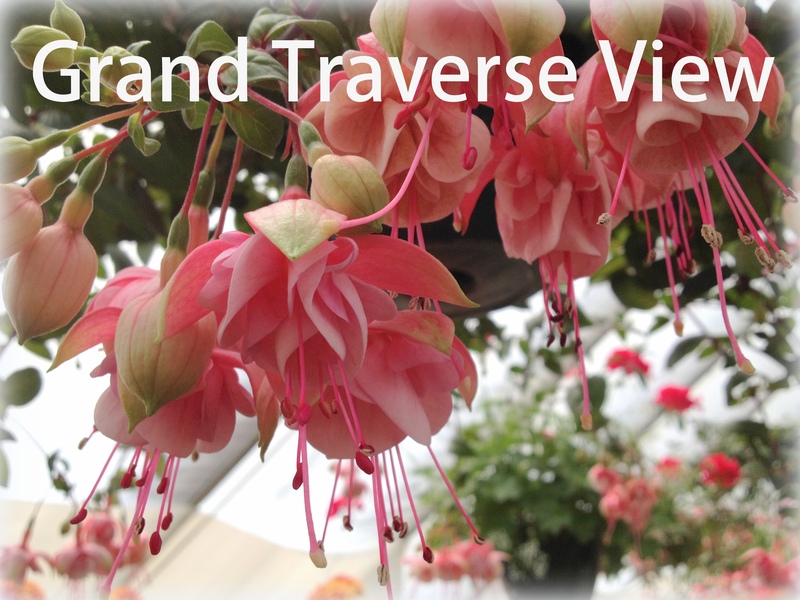 Grand Traverse has been consistently making the headlines in the last few years. With high rankings on lists like best places to live, most romantic cities, best ice cream and best places for local wine. Sshhhh! That’s what locals are saying about these accolades. Ssshhhhh!!!! Well friends, I’m afraid that cat is out of the bag. Tourists are figuring out that the Grand Traverse area is the next best place to explore. Location: In the northwestern part of the lower peninsula of the state of Michigan in the United States of America. Language: English is the primary language, although the rural areas are historically farmland, so there is a significant Spanish speaking migrant worker population. Local Terms: A Fudgie is a tourist, originally comes from one who has to buy Doug Murdock’s Fudge before leaving to go home. A Snowbird is a part time resident who flies the coop for warmer weather in the winter. Currency: U.S. Dollars and some locals exchange Bay Bucks. Time: Grand Traverse area is on Eastern Standard Time. Transportation: Taxi service in the Traverse City Region is served 24 hours a day, 365 days a year. Hotels often have shuttle service. Public bus system serves most of the region. Car rentals are also available. Counties: The counties we cover mostly in our blog are Benzie, Grand Traverse and Leelanau. We’ll go into Antrim and Charlevoix at times, and may even stretch it up into Emmet County a little bit too. 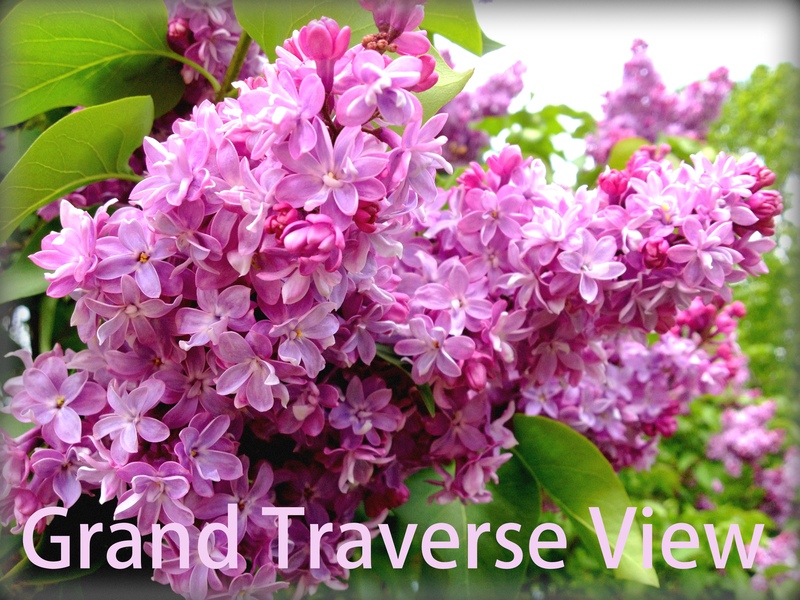 Cities, Towns and Villages: Traverse City (T.C.) is the largest city in this area. Others include Petoskey, Charlevoix, Elk Rapids, Interlochen, Lake Ann, Lake Leelanau, Suttons Bay, Northport, Leland, Empire, Frankfort, Glen Arbor, Old Mission, Torch Lake and Mackinaw. Population: The population was 14,674 at the 2010 census, with 143,372 in the Traverse City micro-politan area. Geography: Other than it being the tips of the pinky and ring finger on your left hand? Maybe that’s not technical enough. The hills and lakes were shaped by glaciers thousands of years ago. Beach Maple Forests are mixed with Northern and White Pines. Sand dunes are vast. Crystal clear fresh water flows through the rivers and streams into the many inland lakes and finally out into the magnificent Great Lakes. The land is so special that a portion along the Lake Michigan shore is designated as the Sleeping Bear National Lakeshore. Agriculture: Traverse City is the largest producer of tart cherries in the U.S. The first full week of July, the National Cherry Festival hosts approximately 500,000 visitors. The growing conditions on the peninsulas are also ideal for grapes, and there has been a recent boom in wineries popping up in the past couple of decades. History: The area is named for the Grand Traverse Bay which is divided into East Grand Traverse Bay and West Grand Traverse Bay. Traverse City is located at the base. French voyagers in the 18th century named the bay le grande traverse or “the long crossing”. In the 19th century the area grew with the logging industry. Later came the cherry farmers and the railroad. Tourism was and is increasingly, a significant factor in helping to grow the area’s economy as well as the population. Follow our blog to learn more about having your own grand adventure in the Grand Traverse area.